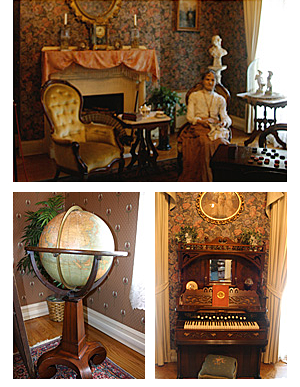 The parlor was the room used by the family in the evenings and for informal entertainment such as afternoon tea. The courting couch, with its divided seating, is an interesting piece of Rocco revival furniture. When a young suitor came to call upon one of the daughters of the household he was asked to have a seat on one end and the young lady took the seat on the other end while the center seat accommodated "Papa". The ornate Beethoven reed pump organ would fill the room with music while other family members would read, play games, or sew some fancy work.